We all know that Look Fantastic has a monthly beauty box but they also do one off collaboration boxes from time to time too. These have previously included Clinique (post here), Molton Brown (post here), MAC and Eve Lom. 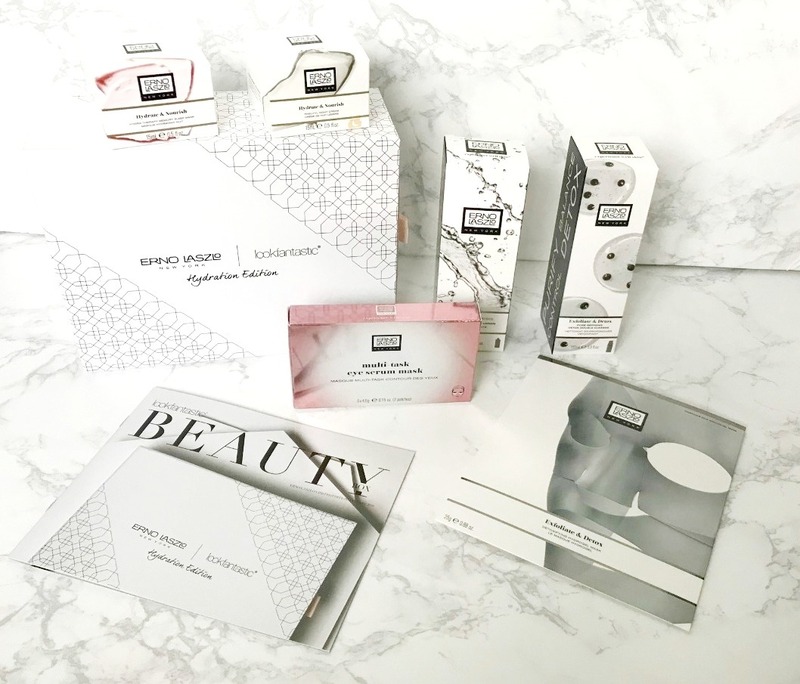 This month, they are working with Erno Laszlo on a limited edition Beauty Box. With a value of over £198 and priced at £60, this really is incredible value! Honestly, this box could not have come at a better time as it's the Hydrating Edition and I don't know about you, but my dry skin suffers in winter! It contains six products - five full size and one single mask. The box itself is very sturdy cardboard with classic black text on white background to reflect the packaging of the products inside. As I mentioned in my 'Best Discoveries I Made In My Advent Calendars' post, I fell in love the Multi Task Eye Serum Masks from Erno Laszlo so I was absolutely delighted to find a box of six in the beauty box. These masks really plump and refresh the under eye area to make it look brighter and concealer applies more evenly after using these masks. They are perfect for anyone whose under eye area shows the results of sleepless nights, fatigue and broken sleep. Next up, there is a single pack Detoxifying Charcoal Mask, which is a gel mask that you apply to cleansed skin and leave for 15-20 minutes. When you remove it, the excess serum can be massaged into the skin (no point in wasting it!) before continuing with the rest of your skincare routine. I used this the night that this box arrived and I found that it was very soothing and calming on my skin. Also I felt that my skin looked brighter and it felt soft to touch as well as looking plump. A definite thumbs up from me. There is a full size bottle of Pore Refining Detox Double Cleanse - so called because it is said to replace the need for separate cleanser and exfoliators. I found this to be surprisingly gentle on the skin and not drying, which also surprised me because products labelled with 'detox' are generally drying. I think that anyone with combination skin would really love this product. I had less success with Light Controlling Lotion, which is used on cleansed skin as a toner. It is quite strongly scented and it felt slightly stripping on my skin - my skin felt tight after using it, but again, those with combination or oily skin might find that it works better for them. The other two products are both for night time use. The first is Hydratherapy Memory Sleep Mask - we all know that I'm a sucker for an overnight mask! I obviously haven't used it for long enough to give a full review but first impressions from a few uses are good The texture is very jelly-like and it absorbs instantly to soothe the skin and instantly quench its thirst. The morning after using this mask, my skin is really soft to touch and plump, which in turn makes it look radiant and rested. The final product is Phelityl Night Cream, which is a rich, nourishing cream - my kind of moisturiser! It cocoons the skin to lock in moisture and leaves my skin feel ultra nourished, smooth and soft. It's worth buying the box for this alone as this moisturiser is priced at £100! It is perfect for the cold nights that we are currently experiencing. Overall, I think this is a brilliant box - great value for money and all but one of the products is perfect for my dry skin but I think that those with normal or combination skin would really enjoy it too! Are you a fan of Beauty Boxes? I'd love to hear! All products are bought by me, unless otherwise stated. This box was kindly sent to me but this is not an ad as I was not paid to mention it. Please see ASAI rules for bloggers in Ireland here. Opinion is always my own. Affiliate links may be used.